The compliance department’s voice is increasingly being heard at the highest levels of firm management. Boston, December 7, 2016 – In a post-global-financial-crisis world, lackadaisical attention to compliance standards is undoubtedly a relic of an era past. 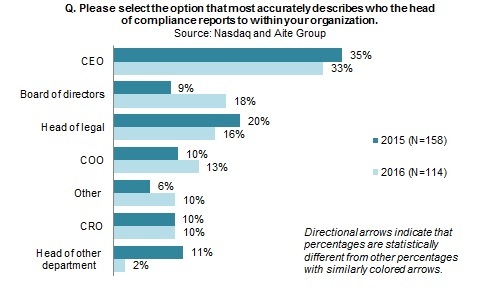 The sea change in internal and external attitudes toward the compliance function’s importance is readily evidenced both anecdotally and in the headlines. Across global market centers, the role of compliance within the firm has shifted from a mundane administrative function to an integral part of firm operations, strategies, and even identities. In this Impact Note, Aite Group discusses the evolving role of the compliance department as a key function within the firm. Based on proprietary Aite Group research as well as data collected in surveys executed by Nasdaq and Aite Group in 2015 and 2016, it explores drivers of compliance evolution, compliance departments’ role within firm hierarchies, interdepartmental collaboration trends, and relationships between compliance and the front office. This 23-page Impact Note contains 24 figures. Clients of Aite Group’s Institutional Securities & Investments service can download this report, the corresponding charts, and the Executive Impact Deck.